It will be another month or two before our local blueberries are ready. 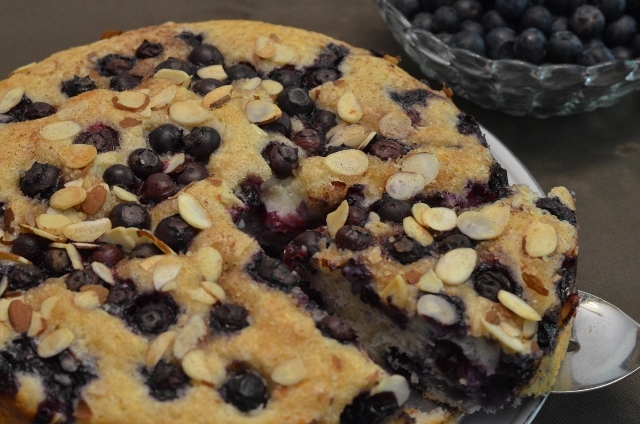 But while we wait for our local berries, here is a recipe that uses fresh blueberries (or you can use frozen berries) that is good as a dessert or as a coffee bread. 1. Preheat over to 400 degrees. Whisk together first 4 ingredients in a large bowl. 2. Sift together flour and next 3 ingredients in another bowl. Stir flour mixture into egg mixture just until dry ingredients are moistened. 3. Toss 1 1/4 cups blueberries in 1 tablespoon flour; fold into batter. Pour into a lightly grease 9-inch spring-form pan. Sprinkle with remaining 1/4 cup blueberries. 4. Stir together 2 tablespoons turbinado sugar, sliced almonds, and cinnamon; sprinkle over batter. 5. Bake at 400 degrees for 25-30 minutes or until a wooden pick inserted in center comes out clean. Cool in pan on a wire rack 15 minutes; remove sides of pan. I can smell and taste this from here…yummy!!! !